It’s April Fools’ time here at the Bruce! Don’t worry- We won’t try to fool you on this blog. Rather, we’ll delve into some of the more outlandish science-based theories (conspiracy or otherwise) in honor of the occasion. In this discussion, we use the word “theory” to mean an unsubstantiated conjecture, not as an established scientific explanation (like the theory of evolution or gravity). It would take a month of science blogs to go into the full details of each of these theories, but here you can enjoy our selective exploration of some of the most intriguing and entertaining. A small subset of people still believe that we are living on a flat planet rather than a round one. Flat Earth believers (or “flat Earthers”) came into the spotlight when the rapper B.o.B. posted a series of tweets supporting the theory in January. Flat Earth supporters rely on assumptions that might seem reasonable at a glance but that fly in the face of centuries of scientific discovery. To examine the concept of a flat Earth, we need to understand the arguments for it – And why they’re insurmountably flawed. These are just a couple of many reasons why flat Earthers think their perspective is the correct one. If the Earth is really round, why don’t people on the bottom fall off? How does water stay on the surface? If you pour water over a balloon then the water rolls right off. Why would the Earth be any different? Many flat Earthers think the real world map looks something like this, with continents surrounding a central arctic. Antarctica is the ice wall that prevents us from falling off the edge of the Earth. Gravity is an intrinsic property of the universe we live in. Particles with mass are drawn to other particles with mass. Gravity affects all objects in the universe, from the tiniest specks of dust to the most massive celestial bodies. The strength of the gravitational pull of an object is dependent on the mass of that object. The Earth is many times more massive than a human. No matter where you are on Earth, you stand upright because you’re being pulled towards the core. The same holds true for water. 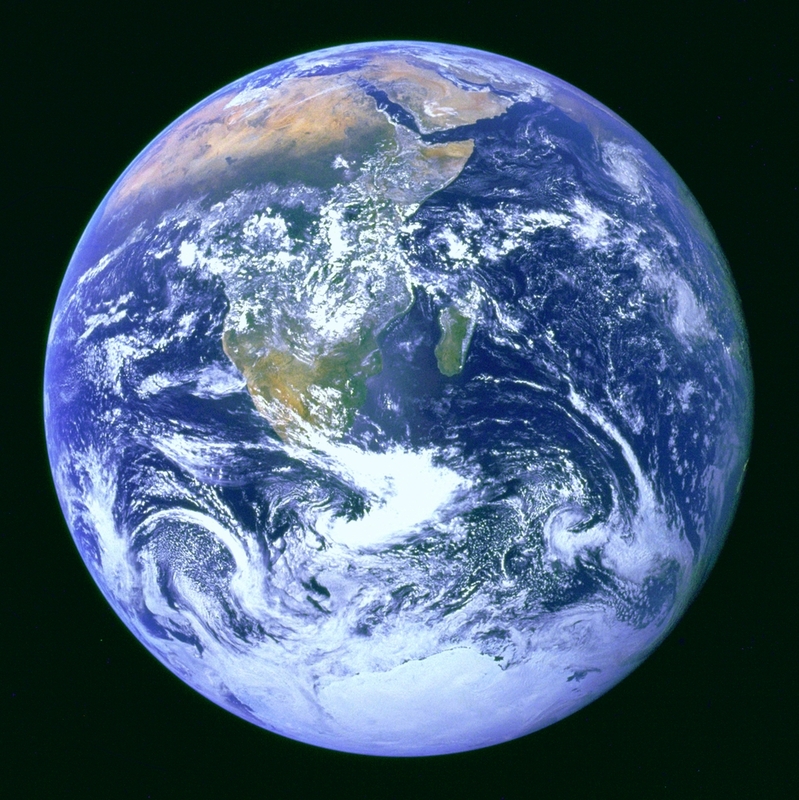 Water stays on the surface of the Earth because gravity holds it there. Water runs off a balloon because the pull of the Earth’s gravity is so much stronger. If that same balloon was floating in the depths of outer space without any large objects in the area, it might actually be able to attract some space dust with its gravity! If the Earth is constantly moving through space, spinning and circling the sun, why aren’t we being blown away by hurricane-force winds? Luckily for those of us who enjoy being able to walk around without being blown over, air tends to move along with the rotation of the Earth. The atmosphere in general is held close to the Earth by – You guessed it, gravity. The reason it moves along with the Earth is friction. Friction between the air molecules and the land pushes the air along. Newton’s first law of motion states that objects in motion stay in motion unless acted on by an outside force. This means that the air molecules stay moving along with the rotation unless other forces are at play (We do have wind sometimes, after all). For support of a round Earth, see above. Sorry, Bigfoot fans. The official position of the Bruce Museum Science Department is that the only hairy hominids wandering forests of the Pacific Northwest are campers that have been in the woods for too long. The origins of the Bigfoot mythology can be traced far back into the folklore of the Native Americans. These days, most Bigfoot evidence comes from hoaxes or reality TV shows. What about all the Bigfoot hairs that people keep finding? When tested scientifically, so-called Bigfoot hairs tend to come up with mundane identities, such as bears, cows, or other local animals. Interestingly enough, one “yeti” hair gave some rather unusual results. In 2013, British geneticist Brian Sykes examined a hair that has been attributed to a yeti. He found that it matched to a bear, but not just any bear. The closest genetic match was to an extinct relative of the polar bear that died out tens of thousands of years ago. Bears can look a lot like furry humanoids when they’re walking on their hind legs. Maybe an unidentified bear species is behind the sightings! Research shows that humans might not be 100% Homo sapiens after all. Through comparative genetic analyses, scientists found that humans have interbred with at least two different hominid species. As much as 20% of the Neanderthal genome can be found spread out amongst humans, though usually only as much as 2.1% in any single human. We’ve also shared genes with a mysterious race called the Denisovans. The only fossil remains we have of this species are a finger bone and two teeth. From these, the genetic sequence of Denisovans has been developed. Denisovans interbred with Neanderthals, but they also interbred with us. Tibetans have a particular gene that helps them live in their high-altitude and low-oxygen homeland. This gene is also found in Denisovians. If we want to find ancient hominids walking among us, we don’t need to look any further than our own genome! It seems like there’s a new conspiracy theory regarding the imminent destruction of the Earth (or maybe just humanity) every year. We survived the new millennium, survived the supposed Mayan apocalypse of 2012, and continue to survive despite the frantic few in our midst that cry otherwise. Planet X (or Nibiru) is a long lasting favorite of conspiracy theorists. The idea behind the theory is that there is a large planet somewhere in the outer reaches of the solar system which occasionally passes close to Earth and causes chaos and destruction. Theorists expect that the passing of Planet X will cause the very crust of the Earth to destabilize, pulling the continents severely out of place. They think that this happens every 3,600 years, wreaking havoc on humanity over and over. If there was a planet near enough to Earth to cause trouble anytime in the next few decades it would be readily apparent to stargazers, even those without telescopes. Given that the Earth is always revolving around the sun and changing our perspective, Planet X couldn’t be lurking behind the sun either (unless it somehow is moving around the sun at the same speed as us but on the opposite side). Additionally, if there was a global cataclysm every 3,600 years, it would be pretty obvious based on historic records. 3,600 years ago, the Ancient Egyptians were well established. The Shang Dynasty was in power in China. Mycenean Greek warriors were riding around on chariots. If there had been a cataclysm, surely it would have been recorded by all of the cultures of the time. Humans have been around and taking notes for thousands of years. If something horrible was occuring every few thousand years we would have noticed! Planet X almost certainly exists, though not the version that conspiracy theorists believe in. Two renowned planetary scientists, Konstantin Batygin and Mike Brown, announced this year that they found evidence for a Neptune-sized planet roaming around the edge of our solar system. This planet appears to orbit the sun every 15,000 years. In addition to co-discovering Planet X, Mike Brown also demoted Pluto. They haven’t actually spotted this planet yet. Rather, their conclusions are based off of looking at the positions of what they can see. They found clusters of space objects that were almost certainly caused by the passing of a large planet. According to their calculations, Planet X never gets closer than 200 astronomical units to the sun, making it seven times further away than Neptune even when it’s at its most near. This is too far out to cause any sort of problems for Earth. While no one can say with 100% certainty that Planet X exists until it is spotted, it’s very likely that we’ll be adding a new ninth planet to our knowledge of the solar system sooner or later. Did you know that alligators are more closely related to chickens than lizards? We're not fooling you. Stay tuned for future subjects in Bruce Museum science blogging! We hope you enjoyed our foolish science blog! If you still haven't had enough foolishness, I recommend you look up the elaborate dancing of the peacock spider. They have rhythm and aren't afraid to show it!